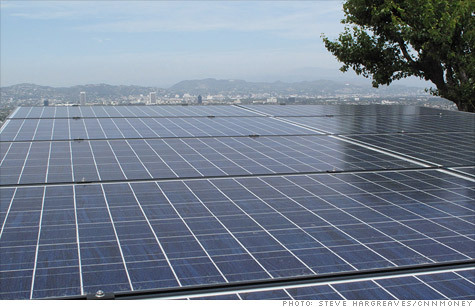 Google's investment in SolarCity will fund 7,000 to 9,000 home solar arrays. Watch SolarCity in action. NEW YORK (CNNMoney) -- Google and rooftop solar power company SolarCity announced a $280 million investment deal Tuesday, the largest such deal for home-based solar power systems in the United States. The investment will give San Mateo, Calif-based SolarCity the funding to build and lease solar power systems to a 7,000 to 9,000 homeowners in the 10 states where it operates. Founded five years ago, SolarCity has 15,000 solar projects around the nation completed or under way. Customers who wish to have the company's solar system installed at their home can pay for it outright, but most choose instead to let SolarCity retain ownership of the equipment and rent back the use of it through monthly solar lease payments. As SolarCity's financing partner, Google (GOOG, Fortune 500) plans to recoup its investment over time through those lease payments. "We hope to be seen as a model," said Rick Needham, Google's director of green business operations. Needham wouldn't elaborate on the exact terms of the deal, but said "these investments are designed to earn us a good return on our capital." Funding arrangements like this are not uncommon in the energy businesses, but they have previously been restricted mostly to utilities and a handful of banks with specialized industry knowledge. Google's entry into this type of financing is both a sign that more companies may be interested in funding alternative energy ventures and a nod to the fast-growing market in leasing residential solar panels. "Google is out in front on this," said Nathaniel Bullard, an analyst at Bloomberg New Energy Finance. "It's a sign of confidence in the space." Google likes to experiment with clean energy investments -- witness last year's wind farm investment -- but the SolarCity deal marks its first move into the residential market. SolarCity is one of a handful of companies that lease solar panels to homeowners. The idea behind leasing is to keep things as simple and cheap for the customer as possible. In SolarCity's case, the customer signs a multi-year agreement with the company and begins writing a monthly check to the firm that's ideally 10% to 20% percent lower than what they were previously paying for their monthly power bill. SolarCity then handles the rest -- everything from purchasing and installing the panels to claiming the various tax credits offered by the federal, state, and sometimes even local governments. Eliminating the often hefty upfront costs for buying a solar system, as well as handling the maintenance and tax issues, has been a boon for the industry. Nationwide, the number of homes installing solar has gone from under 10,000 annually in 2006 to nearly 50,000 in 2010, according to the Solar Energy Industries Association. "The biggest constraint is financing," said SolarCity chief executive Lyndon Rive. Generous government subsidies are the main reason the economics for solar work in the United States. Between federal, state and local incentives, up to 50% of the cost of a solar system can often be subsidized. The government is funding this industry because it hopes that creating a market will foster technological innovation in the space, driving down the cost of solar panels to the point where they are competitive with fossil fuels. Rive hopes more companies will follow Google's lead and use some of the trillions in cash they have stockpiled to invest in the clean-energy market. Google may well be getting a return on its investment, but the company also sees an advantage in promoting cheap, renewable energy. Its server farms eat up massive amounts of electricity. "Energy drives our businesses, and we want our energy to be clean," said Needham. "Over time renewable energy will be cheaper than fossil fuel. We're doing what we can to make that happen faster."